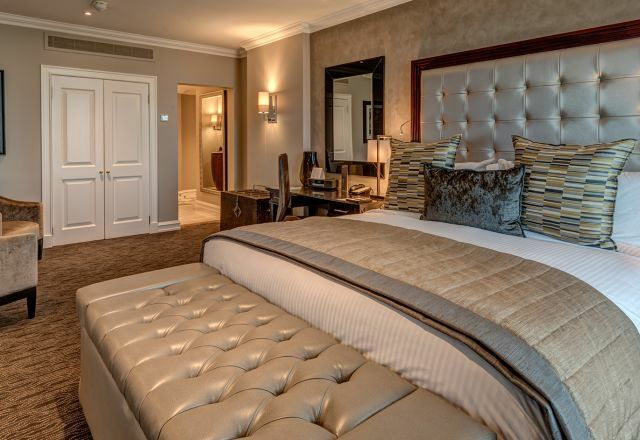 Executive rooms at the InterContinental Johannesburg O.R. Tambo Airport hotel are a spacious 44m2. Each Executive room features a work area, soundproofed windows, en-suite bathroom, and an additional seating area. Each room also offers individually controlled air-conditioning, an espresso machine, mini-bar, trouser press, safe and television with DStv, DVD player, pay-per-view movies and complimentary WiFi. Executive rooms are a superb choice of O.R. Tambo airport accommodation, providing everything that is needed for a successful business trip or a luxurious layover. Executive room features a work area, soundproofed windows, en-suite bathroom, and an additional seating area.